MAYOR HANCOCK ORDERS POLICE TO STOP TAKING PEOPLE’S SURVIVAL GEAR WHEN ENFORCING THE CAMPING BAN!! Mayor Hancock Orders Police to Stop Taking People’s Survival Gear when Enforcing the Camping Ban!!! Homeless people of Denver just won big!! 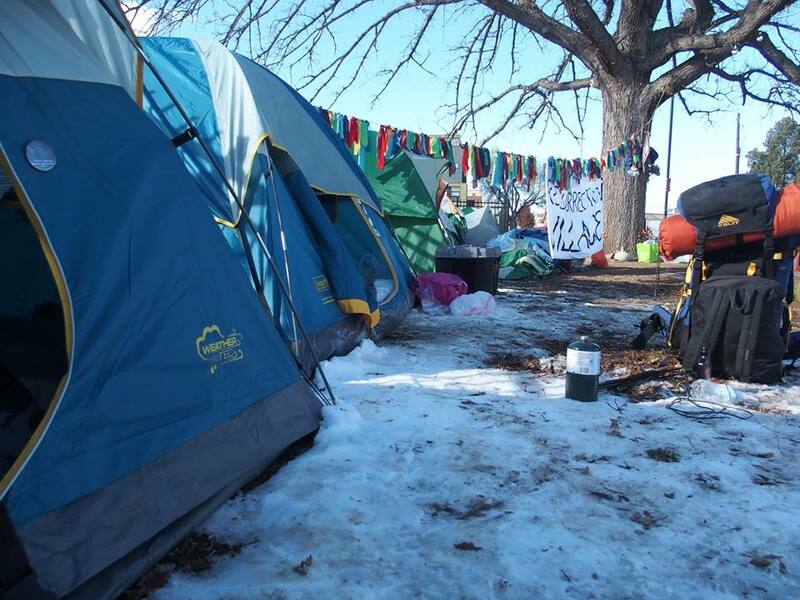 Police will no longer be ordered to take people’s blankets, sleeping bags, tents, or other such survival gear as evidence of the crime of camping during the winter months. This comes after well-renowned lawyer David Lane contacted the City Attorney’s office on Friday informing them he would be filing a Temporary Restraining Order against the city of Denver to stop these seizures of survival gear. Just after a meeting with Attorney Lane and would-be-witnesses who have had winter survival gear taken in sweeps and suffered severe, even life threatening effects, we received this notice from the Mayor’s office. This decision from the Mayor also comes after countless actions including an open letter from ACLU to the Mayor demanding an end to this, viral videos of police taking people’s blankets as evidence of the crime of camping, a loud out cry from the public, and endless action by people surviving on the streets to stand up to this injustice. This directive means that homeless people should not have their survival gear taken from them while police are enforcing the camping ban. This means that people surviving on the streets this winter will have just that much more hope to live through this winter. This however is just one small step toward protecting people’s right to survive. This does not overturn the camping ban or even suspend it for the winter. This does not stop police from forcing people to “move along,” take down tents, or give tickets for the camping ban. This does not stop police and public works from conducting sweeps where they come through and take people’s property while claiming it to be an “encumbrance” or “abandoned.” This does not decriminalize homelessness in all the many growing ways it is being criminalized. And of course this does not end our housing crisis to enable people to actually afford homes. As much as the city wants to claim that every homeless person in Denver can go into the shelters, this continues to be a lie. The presence of open beds does not equal the ability of people to stay in those beds. Much less the desire – the city itself has recognized they cannot force people into shelter like jail. Furthermore, the Mayor’s claim that they only took people’s gear as evidence while “protesting” (surviving) at City Hall is also false as can be seen in this video. And even more important the Mayor’s claim that the city has only taken blankets or tents from only three people is most blatantly a lie as can been seen in countless sweeps where the city takes people’s belongings. All this said, this is one vital step to respecting our lives by not taking our blankets as evidence of our necessary crime of surviving. And we should all know Mayor Hancock did not just decide this out of his own good will. This directive was made due to the legal and public pressure showing this is just plan wrong. This was made possible because of everyone who stood up for their own rights or the rights of their fellow human kind!! For this moment though we will celebrate our win – Blankets can no longer be taken as evidence of our crime of surviving. DENVER – Mayor Michael B. Hancock today announced a cold-weather adjustment to enforcement of the city’s unauthorized camping ordinance. “As a city, we have a responsibility and moral obligation to protect the lives of our residents. Urban camping– especially during cold, wet weather — is dangerous and we don’t want to see any lives lost on the streets when there are safe, warm places available for people to sleep at night. Every night, we have beds open for people to sleep and every day we have safe places and resources to help people experiencing homelessness,” Mayor Hancock said. The city and its homeless shelter partners are continuously tracking shelter availability and adding space whenever needed to ensure we have warm, safe places for people to sleep at night. We absolutely have space open. Denver will cease taking camping equipment, like tents and blankets, when enforcing the unauthorized camping ordinance through the end of April. To date, the city has taken camping equipment as evidence from three individuals who were camping outside the City and County Building during a protest demonstration on Nov. 28. On that day, the city began notification of our camping ordinance at about 9:40 p.m. and worked to gain voluntary compliance over the following six hours with the demonstrators. These are the only individuals who have had blankets or tents taken. When enforcing the unauthorized camping ordinance, Denver police provide several verbal and written warnings before they issue a citation. Per the ordinance, officers request wellness checks by human services professionals for individuals found camping outdoors in the city. Over the past two weeks, after multiple notifications, police issued nine citations to seven individuals. Over the last 24 months, the city and our metro partners have placed 995 homeless people into housing. …where leftist teachers can drag children with food scraps to toss to encaged, retching, peeing winos and learn marxist theory that filth, pestilence and misery are our best moments and acquisition of prosperity and private property is immoral.